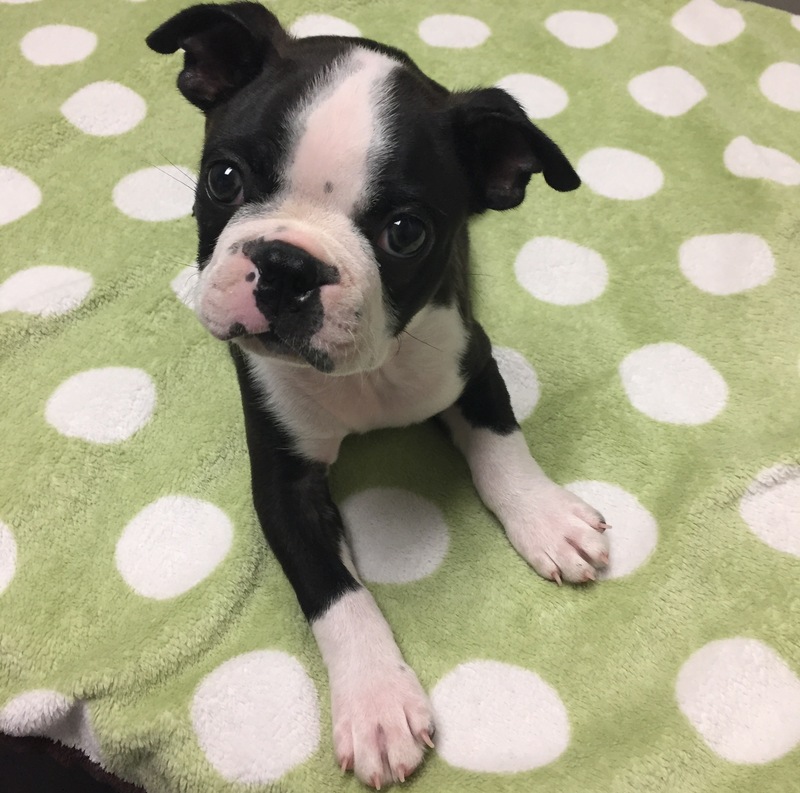 Liam is a Boston Terrier puppy who came to us at almost nine weeks old for his first puppy visit and vaccinations. Liam’s person had purchased him from a breeder six days prior and she was already madly in love with him. Liam’s mom was heartbroken when we discovered a heart murmur and malocclusion (an irregularity in the alignment of the teeth). To Liam’s owner he appeared to be a perfectly healthy puppy. People assume when they buy from a breeder they are getting a healthy dog. The fact is, even a reputable breeder may be selling unhealthy animals; whether they are aware of it or not. For this reason, it pays to research the breeder. An honest breeder will not intentionally sell you a sick pet and may offer a refund or replacement for a pet with a previously undiagnosed ailment. Unfortunately, Liam will require an echocardiogram with a veterinary cardiologist to determine the severity of his heart murmur. Liam may also require oral surgery to remove his mandibular canines so they do not cause trauma to his hard palate. Our hope for Liam is that his heart murmur is benign and his malocclusion resolves when his permanent teeth come in. While the majority of puppies are healthy, stories like Liam’s are not that uncommon. If you find a puppy (or any animal) that you would like to add to the family, consider bringing them in for an exam before you commit to purchasing or adopting. An early exam could save you money and, more importantly, heartache. While some agencies, like shelters, provide a physical exam prior to rehoming, many do not. Ask the current owner if an exam was performed and, if so, if you could have a copy of the exam. If an exam was not done, tell the seller that you are very interested in the animal, but that you would like to have an exam done prior to finalizing the deal. Do not let the cuteness of a puppy or kitten cloud your judgement. While most animals do not have the issues that Liam did, we want owners to know that the doctors and staff at AVC are committed to providing the best and most comprehensive care available to all our patients. We offer 50 percent off new client exams and complimentary exams for patients adopted from a shelter, within 10 days of adoption. We also offer puppy packages that include wellness exams, vaccines, and preventatives to get them started on the right track. We at AVC look forward to caring for Liam, and your pet, well into the future.